Clovers, the primary ingredients in this blend, are a type of legume that are critical to any plot as forage or complementary plants. They are tender and palatable, and they provide high levels of protein and carbohydrates that deer populations love. Plus, they play host for nitrogen-fixing bacteria, which help maintain critical nitrogen levels in the soil. The second ingredient in this formula, chicory, is a plant used in New Zealand as a forage on commercial venison farms. It has an elongated leaf and produces a taproot that allows the plant to better survive periods of drought—a useful trait in hot, sometimes dry southern summers. 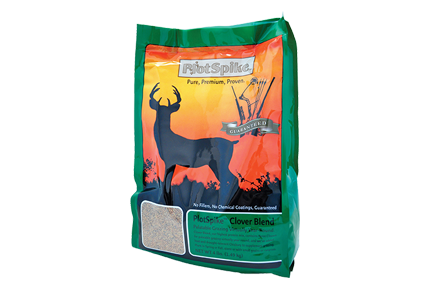 Plant Clover Blend alone at 4 lbs. per ½ acre or with 30–50 lbs. of ryegrass or small grains at 4 lbs. per acre.